Originally developed by TackTick. the T060 is possibly the most used tactical digital display in dinghies and small boats. It’s light, easy to read, reliable and precise and the solar charger means it won’t fail half way through a race. 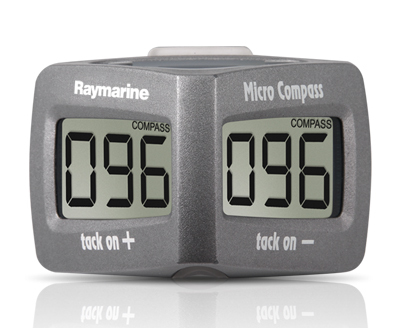 The Tacktick Micro Compass’s tactical scale gives you clear stable figures for port and starboard tacks. When tacking, the readings are always the same, hence remembering numbers isn’t necessary. Key Features:No wires or connections to make. Simple to set-up and use. Totally waterproof (submersible to 10m). Shock resistant. Lightweight only 153g (0.34lbs). Ultra wide viewing angles. Battery level indicator. Easy to read large digits. Options: Mast and deck cradles are available. The T061 includes the mast cradle which is fixed by a velcro strap. Pro: Can be read with polarized glasses, battery holds 200 hours of charge, easy to use (only 2 buttons), switches to compass mode after start, waterproof, floats. Summary: The Tacktick is a very useful piece of equipment which can make spotting and taking on jibs much easier. However the price is very high for what you get. This topic was modified 4 years, 7 months ago by Paul White.